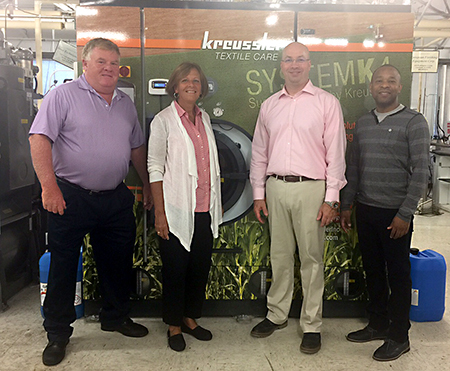 In 2017 Kreussler donated a Solvon K-4 drycleaning machine. Students are able to gain hands-on experience with the machine during DLI’s courses to learn how it can be used in the cleaning process. Lacking a required universal training and certification program, Fitzpatrick said the industry needs “to encourage as many cleaners as possible to participate in and take advantage of the training and education programs of our trade associations like DLI’s School of Dry Cleaning Technology. “Making scholarships available helps to preserve our investment as well as benefit DLI and our clients and the industry as a whole. We are excited for the opportunity these will provide to the current and future generation of cleaners,” Fitzpatrick said. DLI will award one Kreussler scholarship per class held in 2018 and Kreussler will award the remaining scholarships to clients. All applicants must be DLI members to be considered for the scholarships. Contact DLI at 800-638-2627 or email Education@DLIonline.org to inquire about how to apply.